Advanced Office Password Recovery | Elcomsoft Co.Ltd. La récupération, l’élimination ou le contournement des mots de passe protégeant les documents créés avec différentes suites bureautiques. Le cassage des mots de passe des documents et des fichiers Microsoft Office OpenOffice, Apple iWork et Hangul Office. Utilise tous les chemins de contournement de protection connus et les vulnérabilités de la famille Office pour la récupération instantanée. Plusieurs cartes graphiques fonctionnent 200 fois plus rapidement qu'un processeur unique. 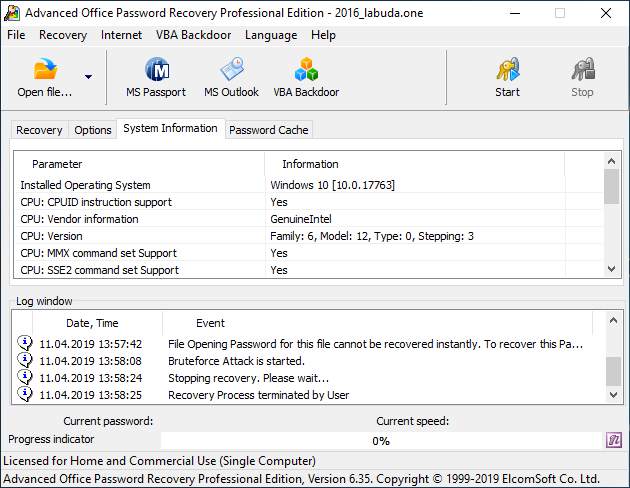 Advanced Office Password Recovery unlocks documents created with all versions of Microsoft Office from the ancient 2.0 to the modern 2019, and supports documents in OpenDocument and Hangul Office formats. 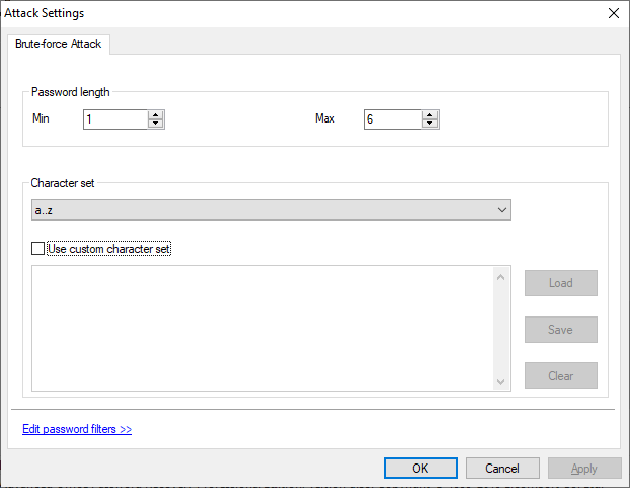 The tool can recover passwords for Microsoft Word, Excel, Access, Outlook, Project, Money, PowerPoint, Visio, Publisher and OneNote, all OpenOffice applications, and all applications comprising the Hangul Office suite. Microsoft has strengthened password protection in Office 2007, further improving its strength in Office 2013. OpenDocument and Hangul Office formats are equally strong. With computation-intensive encryption used in latest versions of Microsoft Office, password recovery tools relying solely on computer’s CPU are no longer able to provide reasonable recovery times. To further boost the recovery speed, Elcomsoft enables support for multiple video cards and simultaneous operation of all CPU and GPU cores. 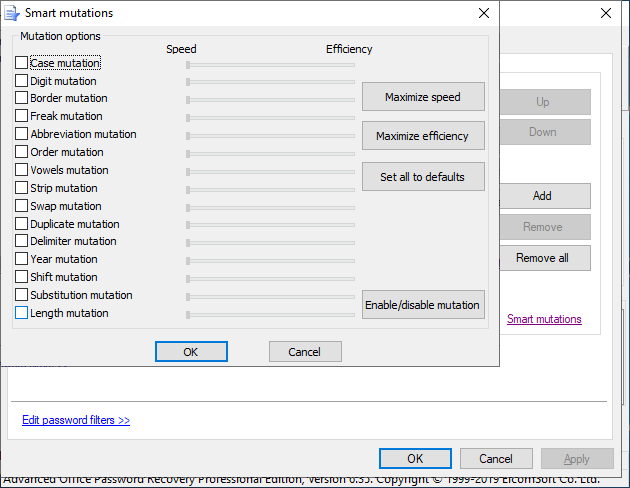 All or some CPU/GPU cores can be designated to the password recovery task, enabling maximum performance or allowing for nonintrusive background processing. The latest generation of [ElcomSoft GPU acceleration technology][gpu] supports unlimited numbers of AMD or NVIDIA boards including the latest generation of high-performance accelerators. Note for Hangul Office users: GPU acceleration is available for Hangul Office spreadsheet application (Hancell), and is not available for its text processing application (Hanword). Not all passwords are equally strong. 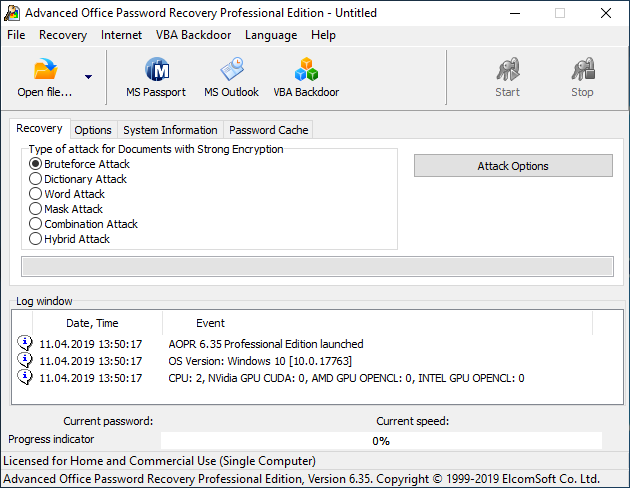 Advanced Office Password Recovery provides instant access to many types of password-protected documents, including those created in Microsoft Word and Excel versions 97 and 2000. Later versions of Microsoft Word and Excel save documents and spreadsheets in compatibility mode by default making them available for instant password recovery. By carefully analyzing the algorithms and implementations of password protection in different versions of Microsoft Office applications, ElcomSoft developed work-around solutions that allow recovering certain kinds of passwords instantly instead of performing lengthy attacks. 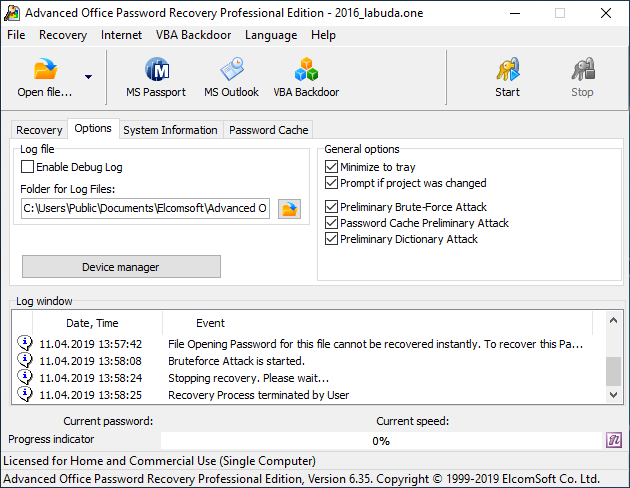 Advanced Office Password Recovery is well aware of the various methods of password protection, and implements all the tricks that allow you to recover protected documents in a matter of seconds.